Jewellery designer Ted Muehling’s first foray into glass is being previewed at 100esign at London’s Earl’s Court, from 27-30 September. Jewellery designer Ted Muehling’s first foray into glass is being previewed at 100% Design at London’s Earl’s Court, from 27-30 September. 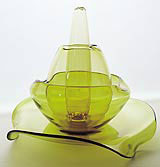 Lotus comprises four separate pieces in green glass which, when stacked, mimic the unfurling of a flower. All pieces are blown and shaped by hand. Lotus, produced by Italian glass company Salviati, will be on sale in London’s Vessel store from 1 October to 10 November.